Surprisingly, I ran across these two in Amazon's Marketplace for $10 each a few days ago. 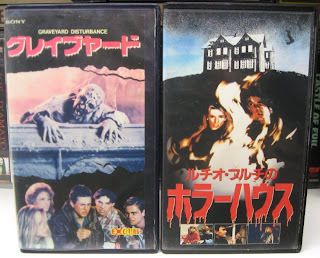 Lamberto Bava's Graveyard Disturbance and Fulci's Sweet House of Horrors on Japanese VHS. I know they're not that good, but Japanese tapes of Italian Horror are snapped up and you'd usually pay around what I paid in total for both in overseas shipping for one.